NOTE: Be sure to wait for a confirmation number once you have completed the online application. Receiving a confirmation number ensures the application process is complete. Drive into your successful future with Woody Bogler Trucking Company! 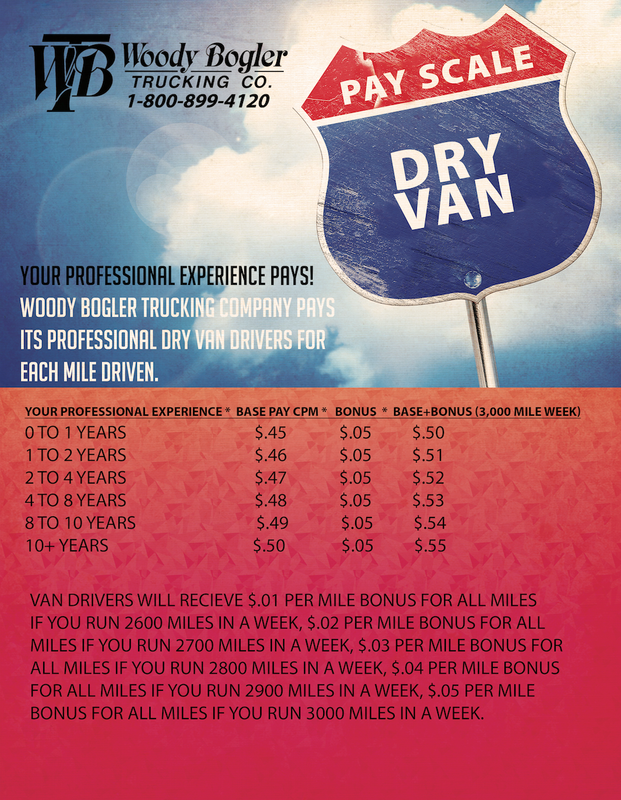 Your professionalism and experience is valuable and Woody Bogler Trucking Company wants to pay you for it! Generous Pay Package, Use Your Clock to Your Advantage, Excellent Bonus Opportunities, Benefits Befitting Professionals! Woody Bogler Trucking Company wants its professional drivers to use their clock to earn as much money as possible. We work hard to drive down deadhead miles, detention and time in the shop so we can keep our professional drivers on the road making money and driving themselves into the successful future that they want. This is why our pay package is designed to reward drivers for their professional experience and their commitment to performance. Woody Bogler Trucking Company wants to pay you your bonus for reaching your performance goals. Sign on Bonus, Anniversary Bonus and Referral Bonus. In addition to its outstanding pay package Woody Bogler Trucking Company also pays its Professional Drivers for honoring us by choosing to work here through a $2,500 sign on bonus. $500 of the sign on bonus is paid on your paycheck after you deliver your first load with the remainder paid every 90 days. Every year thereafter Woody Bogler Trucking Company will thank you for your continued commitment and professionalism with a $1,000 anniversary bonus. That is until you reach 10 years with the company at which time you will receive a $2,500 anniversary bonus annually. Woody Bogler Trucking Company also understands that its professional drivers are the best ambassadors of the company. For this reason Woody Bogler Trucking Company rewards its professional driver for every referral that results in the hire of another Professional truck driver. For every successful referral a $1,000 sign on bonus will be paid to the referring driver. $500 is paid after the referred driver delivers his first load and $500 is paid if the referred driver is still employed by the company after 90 days.